This image, taken by Phoenix's Surface Stereo Imager (SSI) on Saturday, Oct. 19, 2008 (sol, or Martian day, 142) shows Martian dirt piled on top of the spacecraft's deck and some of its instruments. In the upper-left are several wet chemistry cells of the lander's Microscopy, Electrochemistry, and Conductivity Analyzer (MECA). In the lower right is the Thermal and Evolved-Gas Analyzer. The excess sample delivered to the MECA’s sample stage can be seen on the deck in the lower left portion of the image. As the sunsets on NASA?s Phoenix Mars Lander, both literally and figuratively, missionengineers are beginning to shut down some of the spacecraft?s instruments andheaters to conserve what little energy it has left. The Phoenixlander, originally slated to run for 90 days after its May 25 touchdown onthe red planet, has completed its fifth month of exploring the surface of theMartian arctic. Over the course of its mission, the lander dug up samples ofdirt and the rock-hard ice layer underlying the surface of Mars' arctic plainsand analyzed them for signs of past potentialhabitability. But as theMartian northern hemisphere transitions from summer to fall, the spacecraft isgenerating lessand less power as the days grow shorter, reducing the hours of sunlightreaching its solar panels. To keepPhoenix chugging along for as long as possible, mission controllers willgradually shut down four survival heaters over the next few weeks, one at atime, to conserve power. The heaters keep the lander and its instruments withintheir tested operational temperature range. "If wedid nothing, it wouldn't be long before the power needed to operate the spacecraftwould exceed the amount of power it generates on a daily basis," saidPhoenix Project Manager Barry Goldstein of NASA's Jet Propulsion Laboratory(JPL) in Pasadena, Calif. "By turning off some heaters and instruments, wecan extend the life of the lander by several weeks and still conduct somescience." Engineerssent commands to disable the first heater on Tuesday. That heater warms Phoenix's robotic arm, robotic-arm camera and Thermal and Evolved-Gas Analyzer (TEGA),which bakes samples and "sniffs" the vapors given off to helpdetermine the samples' composition. Shutting down this heater is expected tosave 250 watt-hours of power per Martian day. 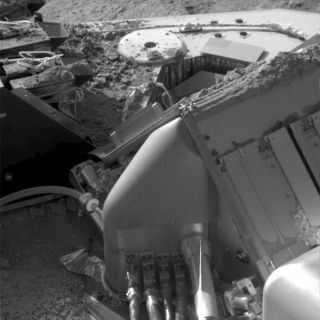 The roboticarm won't be diggingup any more dirt samples though. "Weturn off this workhorse with the knowledge that it has far exceededexpectations and conducted every operation asked of it," said the roboticarm's co-investigator Ray Arvidson, of Washington University in St. Louis. Phoenix finished scooping up all itssamples last week and mission scientists were working to analyze them before Phoenix'stime is up. As powerlevels continue to drop, Phoenix engineers will gradually turn off the otherthree heaters. The second heater serves the lander's pyrotechnic initiationunit and is expected to add four or five days to the mission's lifetime. Thethird warms the lander's main camera and meteorological instruments. Theelectronics that operate those instruments should generate enough heat to keepthem, and the camera, functioning for awhile. The fourthheater ? one of two survival heaters that warm the spacecraft and its batteries? would be shut down in a final step. This would leave only one survival heaterto run out on its own. "Atthat point, Phoenix will be at the mercy of Mars," said Chris Lewickie ofJPL and the lead mission manager. Engineersare also preparing for solar conjunction, when the sun is directly between Earthand Mars. This will happen between Nov. 28 and Dec. 13 and will block radiotransmission between the spacecraft and Earth. No commands will be sent to Phoenix during that time, but downlinks from Phoenix will continue through NASA's Odysseyand Mars Reconnaissance orbiters. For now,mission controllers are uncertain whether the fourth heater will be shut downbefore or after conjunction.